Location of Sandoval in Marion County, Illinois. Sandoval /sænˈdoʊvəl/ is a village in Marion County, Illinois, United States. The population was 1,434 at the 2000 census. Sandoval is located at 38°36′47″N 89°07′14″W﻿ / ﻿38.612966°N 89.120632°W﻿ / 38.612966; -89.120632. According to the 2010 census, Sandoval has a total area of 1 square mile (2.59 km2), all land. Sandoval is located at the junction of U.S. Route 50 and U.S. Route 51. In the 1890s, Sandoval was a sundown town, prohibiting African Americans from entering or living in the town. As of the census of 2000, there were 1,434 people, 562 households, and 396 families residing in the village. The population density was 1,494.0 people per square mile (576.7/km²). There were 641 housing units at an average density of 667.8 per square mile (257.8/km²). The racial makeup of the village was 97.77% White, 0.42% African American, 0.84% Native American, 0.28% Asian, 0.21% from other races, and 0.49% from two or more races. Hispanic or Latino of any race were 0.98% of the population. There were 562 households out of which 38.6% had children under the age of 18 living with them, 48.8% were married couples living together, 16.9% had a female householder with no husband present, and 29.4% were non-families. 25.3% of all households were made up of individuals and 10.1% had someone living alone who was 65 years of age or older. The average household size was 2.55 and the average family size was 3.04. In the village, the population was spread out with 30.1% under the age of 18, 8.4% from 18 to 24, 28.5% from 25 to 44, 22.1% from 45 to 64, and 10.9% who were 65 years of age or older. The median age was 34 years. For every 100 females, there were 92.7 males. For every 100 females age 18 and over, there were 85.2 males. The median income for a household in the village was $30,000, and the median income for a family was $35,700. Males had a median income of $29,191 versus $19,833 for females. The per capita income for the village was $14,739. About 17.1% of families and 21.1% of the population were below the poverty line, including 31.5% of those under age 18 and 8.6% of those age 65 or over. 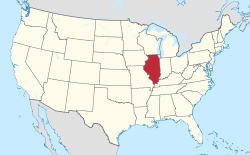 ^ "And This In Illinois". Rock Island Daily Argus. Rock Island, Illinois. July 17, 1893. p. 4 – via Chronicling America. At Sandoval, thirteen miles east of here, owing to the scarcity of labor, two strange negroes were engaged by some carpenters to help finish a house. Negroes are not allowed to live in that place, consequently a party of seventy-five waited upon them, threatening to lynch them if they did not move at once. Things were finally compromised, the men agreeing to leave town as soon as the building is finished. This page was last edited on 18 February 2019, at 05:02 (UTC).